Do you want to use a few creative photo techniques to jazz up your photos? Digital photography gives you an infinite number of innovative possibilities. Whether it's just tweaking the exposure or contrast or giving your image a radical makeover, there are plenty of free and pay-for tools at your disposal. Once you've gotten a basic understanding of lighting, composition and exposure, you can expand your creativity with photography both in your camera and on your computer. 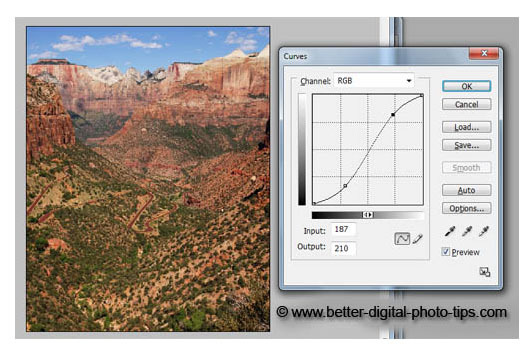 This post will be a great introduction to ideas on how to be creative with photography software. If you need some inspiration on how to boost your creativity with taking photos, here's a better article for you. You have a big advantage over me. You're starting your photography at a time when the number of artistic tools at your disposal is tremendous. You are alive at a great time to be interested in photography? 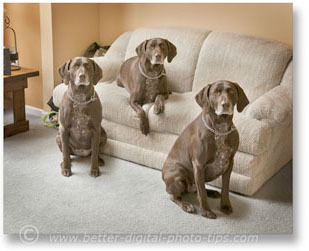 This photo of my dog triplets was really just one dog taken 3 times. It was easy to create, once I learned the software. The composite photograph was created from the three separate photos of the same dog shown below. 3 separate photos were combined. It is actually often a simple digital photo editing trick than can be done easily once you learn it and have planned ahead. To accomplish this effect, you must use a tripod to hold the camera in the exact same spot for every exposure. 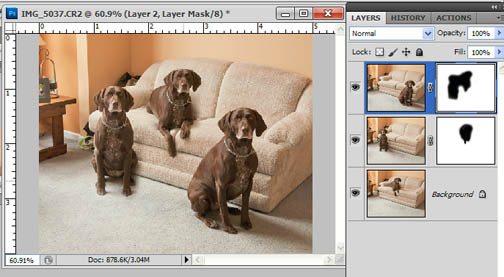 This will insure that you can combine the photos with no loss in quality or sharpness when you do your photo editing. I also needed a couple of dog biscuits to bribe Mocha to stay in each of the 3 locations. A shutter release or the camera's self-timer is also a great idea to make sure your camera doesn't move at all and to keep your images sharp. I used Adobe Photoshop, but you can also use Gimp, which is similar in capabilities and it's free software. There is also a multi-exposure feature within the "Make a Collage" function of Picasa, but you will get the "ghost" effect when you combine the images. Here's how it works in Photoshop. 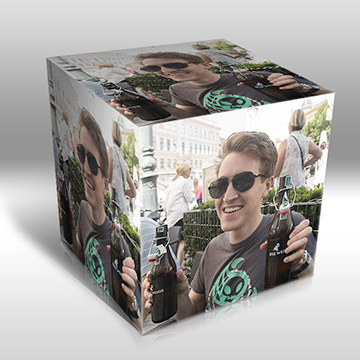 Essentially, you combine your different photos into one by stacking them on top of each other as layers. You can they reveal or hide any part of any of the layers independently by using masks. When you are completely satisfied with you editing, you can "flatten" your layers into one single photograph. I planned out the 3-dog photography composition ahead of time so that there was plenty of room in between the three spots the dog would occupy in each of the separate photos. That makes it easier to combine them later. Another one of those creative photo techniques is really just some creative photo editing that I frequently use with nature photography. Again it is done with Adobe Photoshop. 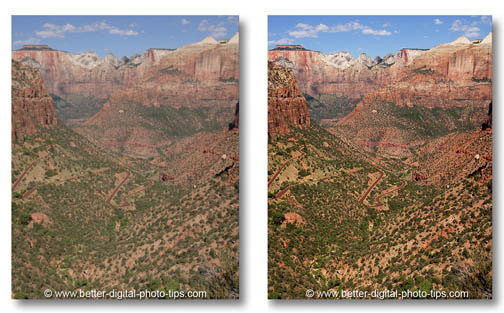 Look at the dramatic difference in the two photos below taken in Zion National Park. This first example of the creativity you can explore was done with an action called "NESTED" in photoshop. It was developed by a company called Panos. I'm not sure that it will have any commercial applications for me, but it's sure fun to play around with. Austrian gardens edited in Photoshop to be nested in sections. There are many ways to improve photos with software. The photo on the left is the original and was a little flat due to the atmospheric haze that abounds in the summertime. I wanted to get some richer blacks in the image to improve the overall contrast. The photo on the right was adjusted using curves in Photoshop. 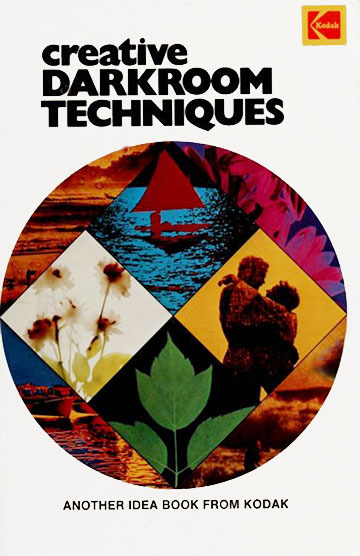 This is a technique used to control brightness contrast in your photograph. The photo on the right was also sharpened a bit using Unsharp Mask applied to the "lightness" channel only in LAB mode. It's a unique technique that I use frequently and absolutely love the results I get. It takes a bit of experimenting to get to your desired result, but my adjustments to the curves often resemble a lazy "S" shape. This shape increases contrast in the shadow areas and the highlight areas, but has little effect on the mid-tones. Please read my articles on creative photo techniques involving shutter speed, depth of field, composition and lighting, also posted to this Digital Photo Tips web site.